Announcing Our New Support Site! We gave our Support site a refresh! Along with a redesign and updated layout, the Support site now features articles with short, instructional videos specific to 3D printing with the Form 2, so you can get ready to print as soon as your printer arrives. Learn more about setting up the Form 2, view some of our top solutions, and review the Quick Start Guide to ensure a successful print! We’ve also updated our current articles to reflect a few features that are new or changed for PreForm 2.0. 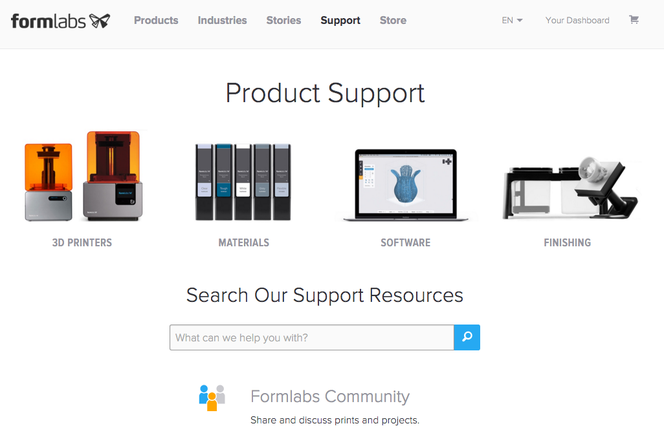 We will continue to add more support articles in the future that will help you make the most of your printer. Don’t forget to head over to to our forum to share your Form 2 experiences! Learn more about our Pro Service Plan that includes a number of features in addition to those that come with standard 1-year warranty that ships with a Formlabs 3D Printer package.